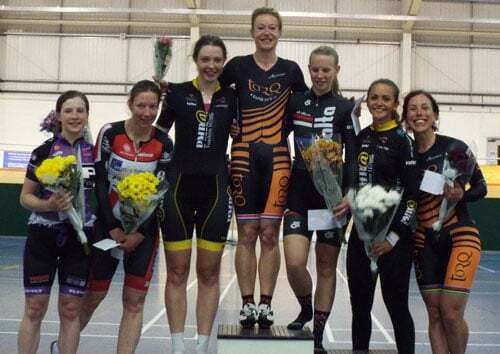 Jan took another emphatic victory in the second round of the National Omnium Series, which took place at the Newport Velodrome in Wales recently. The Omnium, which is now a part of the Olympic programme, is made up of five different events which are raced over the course of the day, with riders accumulating points depending upon their position within each race. To win requires consistency across both Sprint and Endurance disciplines in bunch racing and time trial formats. In the Newport round, Jan was second in the 500m TT and the Scratch race. She then won the Keirin and placed second in Pursuit, which, after four events, gave her a comfortable 10 point lead going into the final event, the Points race. Jan showed great tactical awareness in keeping close to her nearest rivals and scoring more points to secure the Omnium victory overall. “It is always great to win and at this level it is not something that I take for granted”, Jan told us, “I have been racing this Series for more than 10 years now and I have seen it grow in popularity every year, so I have to work harder just to stand still, but I am so pleased to still be a part of it”. Great riding Jan, we look forward to reporting even more successes this season.